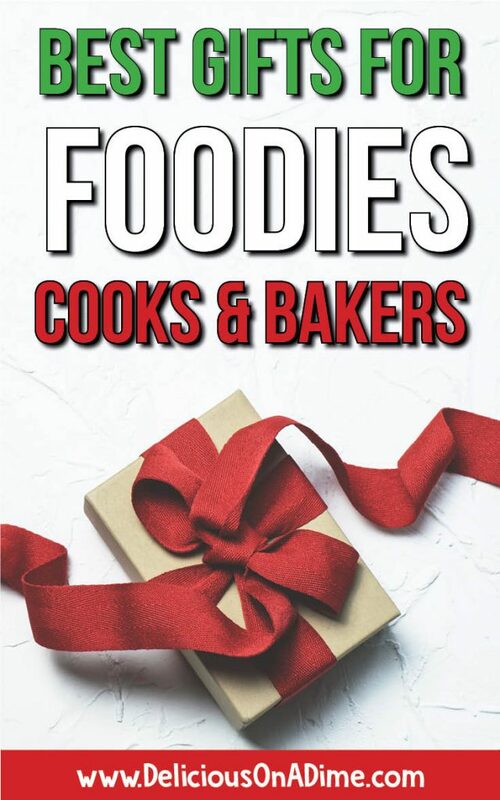 Home » Food for Thought » The Best Gifts for Foodies, Cooks and Bakers! The Best Gifts for Foodies, Cooks and Bakers! Looking for the best gifts for a foodie? Or the best gifts for a cook or baker you love? Whether it’s the holiday season, a birthday or just because, these gifts are sure to delight! Check out our top gift ideas and scratch something off your to-do list today! Are you guys all shopped out yet?! Somehow I doubt it. I find that despite all the good intentions we all have of getting our shopping done early, it always straggles into December. How many of you have a super foodie/cook/baker on your list? What to buy those people?!?! WELL! I happen to love this subject. Whether your budget is big or small, I have some suggestions for you!! Looking for stocking stuffers for family or a Secret Santa gift for a friend or coworker? We’ve got you covered. Check out these awesome little treasures! Instant Read Thermometer – If you’ve read this blog for any length of time, you’ll know that the #1 thing I can’t stop harping about is my instant meat thermometer. I LOVE IT. We actually own two and if the batteries die in one of them I start to get nervous. 🙂 This is such a great little stocking stuffer for the cook in your life and you can pick it up for around $10! Vegetable/Sandwich/Cookie Cutters – Am I the only person who likes to cut food into cute little shapes? I don’t always think to do it, but when I see other people do it I’m like !!!!!!! I seriously love how cute vegetables, sandwiches, cookies, and other food can be when they’re cut into little hearts, flowers, etc. These little cutters are inexpensive and versatile. 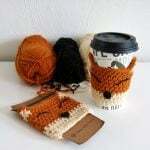 Crocheted Coffee Cozy – This little fox cup cozy is SO cute! I’m in love. And the artist who makes them is from Toronto! Yay for supporting Canadian artisans! There is nothing more comforting on a cold winter’s day than a hot cup of coffee… EXCEPT a hot cup of coffee cozied up in this little fox holder! 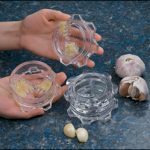 Garlic Mincer – This one is a little pricier, but I think it would make an AMAZING stocking stuffer. Lee Valley is well known for producing great quality items and this little garlic mincer is no exception. I’ve had mine for about 10 years and it is still going strong, even with tons of use. I’ve tried others and they really don’t compare. Spring for this one. Zester/Microplane – Okay, so a zester might not be the sexiest stocking stuffer around, but I honestly find it one of the most useful small tools in my kitchen. We use ours daily, for lemon and lime zest, Parmesan cheese, when our regular grater is dirty (haha). It’s inexpensive and would make a great stocking stuffer, or if you want to make it into a larger gift for the food lover in your life, why not combine it with a little block of real Parmesan cheese?! These gifts are mid-range. I think they’d make awesome gifts for a sibling or friend. Not so small that they feel like a stocking stuffer, but not so big that they break the bank! 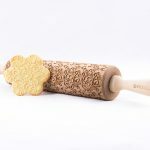 Decorative Rolling Pin – I have a bit of a thing for these rolling pins. I don’t own one (yet). I own a regular rolling pin, of course, but these are just SO gorgeous and would make the most beautiful cookies! I only bake once in a while but I think this would make such a lovely gift for the baker in your life! They sell a lot of different designs too, and they’re all super nice! 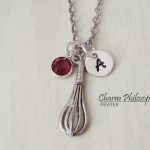 Baking Themed Necklace – These necklaces are so cute! I bought one years ago for a friend when she graduated from baking school, and you can get them for with different charms for bakers, cooks, different birthstones and letters. I think they’re a super cute gift. Budget Bytes – The Cookbook – While I know Delicious on a Dime is your first stop for affordable recipes 🙂 , I think this cookbook would make an awesome gift, especially for anyone who’s trying to save money on groceries! Lots of great, fresh recipes that are affordable and delicious. 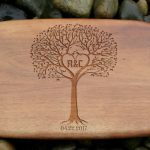 Personalized Cutting Board – If you know me personally, you probably already know that I’m a total sucker for anything with a tree on it. I just love trees. And flowers, plants, leaves. You know, all those naturey things. This cutting board is gorgeous and fairly affordable. There are lots of different images available and you can have it personalized! If you couldn’t bear to cut on it (a distinct possibility), the recipient could always use it as a beautiful cheese tray or serving board. What a lovely gift! Art! 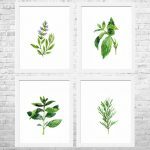 – I love these watercolour prints of herbs, and even if watercoloured herbs aren’t your thing, there is tons of gorgeous art on Etsy that you can browse around for – whether you’re looking for something food/kitchen themed or not. These items are definitely a splurge – but sometimes that’s what you’re looking for! Whether it’s a big gift for your sweetheart or parent, or a group gift that a bunch of people are going in on, check out these dream kitchen gifts. KitchenAid Stand Mixer – A Kitchen Aid stand mixer is one of those things that people love to wish for – and with good reason! It’s not (just) because they look good – I have one and it makes my life so much easier. I can mix up a few loaves of bread in minutes, whip cream in seconds, and it makes baking feel effortless. I especially like that I can put something in it (as long as it’s not super temperamental) and walk away, either to get my next ingredient, or start the next step in the recipe. If you have someone on your list who loves to cook and bake, definitely look into it! Cuisinart Food Processor – Cuisinart makes one of the best food processors around. I invested in this one because I have a small local hummus business, and it has been an absolute workhorse for YEARS now. I’m sure I’ve already used it WAY more than the average person would in a lifetime, and you know what? It’s still going strong. I absolutely love it. I love all the things it lets me make effortlessly, like pesto, pizza dough, whipped dips, hummus and shredded salads like coleslaw. I love that I can make a huge batch of turkey pies or lasagna and chop ALL the veggies in my food processor instead of by hand. It’s a huge time saver and opens a lot of doors for the home cook. Can you tell I’m in love? The Instant Pot – Did you have a feeling this new kitchen tool would make an appearance here? I really love that this one tool can do the work of 7 of my kitchen gadgets (once I bought this I got rid of my yogurt maker and regular slow cooker… I didn’t own a rice cooker, but if I did it would be gone too). This small appliance really does do it all! Pressure cooking is a whole new world for me, but I feel super safe doing it with the Instant Pot and I’m loving the learning process (and the delicious results). Luckily there are a TON of resources online to help me learn how to use this and try different recipes. This is an AMAZING gift for the super busy family that’s struggling to get a homemade supper on the table every night! Food Saver – This small appliance helps us stock our freezer with delicious freezer meals, preserve vegetables from the garden and freeze leftovers to eat another time. It extends the freezer life of food a TON by vacuum sealing it so that there’s no freezer burn. Heart-Shaped Waffle Maker – Many years ago my siblings and I bought this heart-shaped waffle maker for my mom, and I think it’s just the cutest! I think she does too! So much better than boring old rectangular waffles! I think I’d be even more motivated to make delicious waffles from scratch if they were going to be this cute! Are you a foodie? Or a cook or baker? What’s on your wish list this year? Let us know in the comment section below! You’ve convinced me to get an instant pot and food saver! We have been thinking about those for a little while!